Raccoons are found in almost every major habitat in the continental United States, Central America, and southern Canada. The raccoon may be as long as three feet from nose to end of tail. Average adult males are 10–15 pounds, while females are slightly smaller at 8–12 pounds. In the northern parts of their range—or where they are overfed by humans—raccoons may be a good deal heavier, even exceeding 30 pounds. The raccoon's diet is highly varied and includes fruits, vegetables, and acorns. Carrion, earthworms, fish, and other aquatic animals, such as crayfish, are eaten when available. Raccoons aren't particularly effective hunters, but they'll eat small animals like birds, amphibians, and mice when the opportunity arises. Their appetite for foods such as grapes and sweet corn often lead to conflicts with home gardeners. Raccoons are usually active at night, and by day, they retire to denning sites. Dens are made above ground in tree cavities, chimneys and attics, as well as underground in old woodchuck burrows, storm sewers, or crawl spaces under buildings. When they feel secure enough, raccoons may simply lie in thickets or swamps on open ground. Raccoons generally give birth to four to six young from early spring to early summer. Kits are weaned at about two months of age, but may remain with their mother through their first winter. The raccoon is one of four wild animals in the United States considered to be primary carriers of the rabies virus. Despite the concern and fear surrounding rabies, advances in public education, vaccination of pets, and post-exposure treatment have greatly reduced the risk to humans. There has never been a documented human death resulting from the raccoon strain of rabies. The raccoon roundworm (Baylisascaris procyonis), however, is a serious public health concern. This parasite is transmitted through the ingestion or inhalation of eggs passed in raccoon feces. Children should be prevented from playing in areas where raccoons have defecated. Before you begin taking steps to resolve a raccoon problem, make sure the animal causing your headaches really is a raccoon. 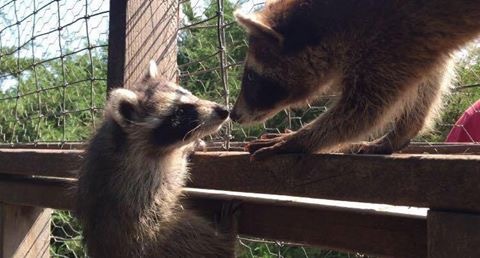 Raccoons are often blamed for more damage than they actually do, while neighborhood dogs and other animals are the actual culprits. You may reduce the chances of raccoon problems by never leaving pet food outside, and keeping secure lids on outside trash cans. Prevention is more practical than removing individual animals. If a good raccoon habitat exists in the vicinity and the original temptation is still there, problems will reoccur. Raccoons are attracted to birdseed and suet, and can cause considerable damage to garden fruits and vegetables, particularly grapes and corn. Garden plundering often occurs right before the foods are ready to be picked, so extra vigilance at these times (chasing animals away and using lights or radios to create disturbances) may drive them off long enough to harvest the crop. Fruit trees and bird feeder poles can be protected with conical metal guards (often called "squirrel bafflers") that keep animals from climbing. Rolled-up sod on lawns is also characteristic of raccoon damage and is a result of their search for large grubs such as June bug larvae. If the grub population is high, raccoons may return repeatedly, rolling up extensive areas of sod on successive nights. Treat your lawn for grubs to avoid this problem. This problem generally is most prevalent with new sod rather than established lawns. Leave the attic lights on. Place a battery-operated radio as close to the denning area, tuned to a heavy metal or talk radio station. Leave the radio turned up as loudly as possible and run it continously for at least 24 hours. Soak old rags in coyote urine and stuff them in the chimney or eaves, or simply spread coyote urine around the entrance point to the den. Allow the raccoon several days to move her babies out of the attic or eaves. To ensure they are gone, stuff the entrance with wadded up newspaper and wait 24 hours. If the newspaper is unmoved, the animals are gone. Once you're sure the raccoons have left, prevent further problems by installing an approved chimney cap or repairing and sealing attic openings. Never use smoke or fire to drive animals out of chimneys. This will almost certainly kill young animals—-whether raccoons, squirrels, opossums, or birds—who are not physically able to leave on their own. NOTE: If you hear constant crying, especially during the daylight hours, this usually is an indication that there are baby raccoons that have been orphaned. Time to call in professionals. Keep the garbage cans in a closed space such as the garage. Use heavy garbage cans with tight fitting lids. Each time you add garbage to your garbage can pour ammonia over the garbage. Fasten the garbage can lids with heavy rubber bungee cords. Coyote urine, available at many sporting goods stores, is also an effective repellent for raccoons when applied around gardens, garbage cans, decks and porches.